A Denver cop who was fired after being arrested two years ago for driving more than twice the speed limit, and while drunk, may soon have his job back, following a ruling in his favor by the city's Civil Service Commission. But the city's safety manager is vowing to fight the decision. 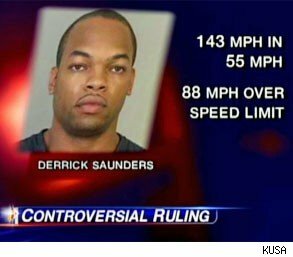 Officer Derrick Saunders was arrested in June 2010 after the Colorado State Patrol clocked him going 143 mph in a 55-mph zone. The arresting officer also found Saunders' blood alcohol level to be 0.089, above the legal limit of 0.08. Saunders pleaded guilty to charges of reckless driving and driving while impaired, and was sentenced to five days in jail. But he fought a Dec. 7 order terminating him, contending that the discharge was unfair and overly harsh. On Tuesday, the Civil Service Commission agreed with Saunders and the union representing him, saying that the officer should receive a 42-day suspension and not be fired, The Denver Post reports. Denver's manager of safety, Alex J. Martinez, who fired Saunders, said in a statement that the commission, comprised of three labor attorneys, misinterpreted codes of discipline that govern such offenses by law-enforcement officers. Martinez wrote that the commission's ruling "undermines civilian authority to manage the police, and uses the concept of consistent discipline to confine the department to the distant past, when courts punished drunk driving with small fines." Martinez also requested that the commission stay the order reinstating Saunders and reverse its "misguided" decision. An official with the Police Protective Association said the rules, known as a discipline matrix, stipulate that, for an offense such as the one Saunders committed, a suspension of 38 to 42 days is the mandated punishment. "The discipline matrix clearly states that this offense was not a termination case and the officer should and is being held accountable by the civil service commission, according to the discipline matrix," the Post quotes union vice president Lt. Vincent Gavito as saying. Denver's chief of police disagrees, telling Denver TV station KUSA that the decision is a blow to the integrity of law enforcement. "It really compromises, and is a credibility issue for the many officers that are out there doing their job right and doing the right thing every single day," Chief Robert White said. "And it's a black eye that we just simply don't need." Saunders, who became a Denver police officer in 2007, was accused in 2009 of pulling a gun on employees at a suburban McDonald's drive-thru window for not filling an order quickly enough. A jury acquitted Saunders of two charges related to the incident in 2010. The ruling in favor of Saunders isn't the first controversial ruling rendered by the commission. As the alternative weekly newspaper, Westword, notes, the panel last November reinstated two officers fired for beating a bystander while he used a cellphone and two other officers who were discharged after they engaged in a car chase after they were told not to.